Multi layered flanky, whole wheat bread, baked in clay oven. 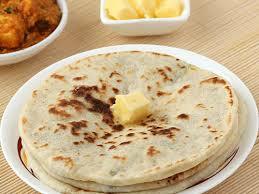 Roti, butter naan, lacha prantha mixed in one basket. Multi layered flanky, whole wheat bread with fresh dried mint, baked in clay oven. Whole wheat thin crispy bread baked in clay oven. White flour bread baked in clay oven. White flour bread with butter, baked in clay oven. White flour bread covered with garlic and baked in clay oven. Bread stuffed with coconut, rasin, almond, cashew nuts and baked in clay oven. Bread stuffed with grated Indian cheese. Whole wheat bread stuffed with potato and authentic spices. © 2017 Gate of India - Fine East Indian Cuisine All Right Reserved.